Be the first to hear about their new releases and deals. Download the Booksprout app and search for Karen Tomlinson today! Karen adores books and will read any genre that catches her eye, but she likes nothing better than an epic fantasy, heavy on the romance, which is set in a new and magical world. Karen lives in Derbyshire, England, (think Mr Darcy territory) with her husband, twin girls and her dalmatian, Poppy. When she is not busy writing, reading (or eating cake and drinking coffee) Karen likes to keep active. She has been practicing Shotokan karate since being fifteen, loves running, mountain biking and walking in the hills with her family. 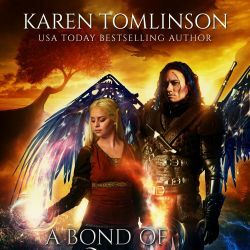 www.karentomlinson.com, follow her on: [email protected] Chat on her Facebook group-Karen Tomlinson's Silver Guardians, or follow her on [email protected] and Instagram @karentomlinsonauthor.